When J.C. Hall passed away in 1982, Don Hall became Chairman. Irvine O. Hockaday, Jr. was named president and CEO. During this time, Hallmark began building for the future by acquiring complementary companies to reach new audiences and channels of distribution. Those businesses include Crayola, LLC, maker of Crayola® brand crayons and art products, and DaySpring, a leading producer of greeting cards for Christian consumers. 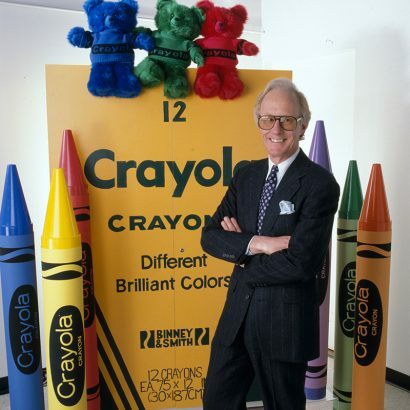 At right, Irvine O. Hockaday, Jr. , CEO of Hallmark when the company purchased Binney & Smith, which would later become known as Crayola. To keep pace with changing times, Hallmark.com was launched as a website offering news and information, and soon moved into e-cards and e-commerce. The Expressions From Hallmark greeting card brand was introduced in mass channel retail stores, making the Hallmark brand available to people wherever they shopped. One of Hallmark’s largest-ever product introductions, the Hallmark Warm Wishes greeting card line, made hundreds of cards available for 99 cents at retail outlets nationwide.